Replacement refs make opposite calls in at the end of Monday's NFL game. The mistaken touchdown call has sparked outrage by fans and could cut into betting. Football fans are outraged -- and Las Vegas is worried. The National Football League has relied on replacement referees in the first three weeks of its season after it locked out the unionized refs in a dispute over pension plans and work rules. The replacement refs have been widely criticized, and that criticism became a firestorm late Monday when a refs' call at the end of the Green Bay Packers-Seattle Seahawks game resulted in a Seattle win -- to the shock of millions watching at home. 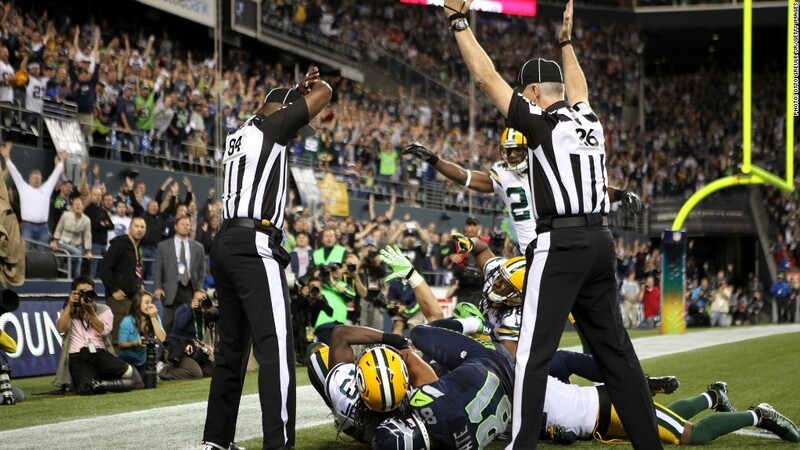 Even the NFL issued a statement saying the Packers should have won the game, but it refused to overturn the call. A casino sports book operator and other gambling experts told CNNMoney Tuesday that there's a risk fans will pull back on their football betting. "Controversy is just not good for our business," said Jay Kornegay, vice president of race and sports book operation at The Las Vegas Hotel and Casino. "When you are taking wagers on any event, you want it black or white. You don't want any gray areas." Kornegay said that when there has been controversy about boxing judges in the past, it has hurt betting on subsequent fights. But he said betting hasn't been hurt over the first three weeks of the NFL season. "America loves football and loves betting on football," he said. The blown call did help casinos and bookies in one way: Kornegay estimates as many as 85% of bettors were betting on Green Bay. The blown call meant a big win for those taking the bets. Kornegay estimates there was between $12 million to $15 million legally wagered on Monday's game. And estimates are that the legal football bets in Nevada make up only 1% to 2% of the money wagered on football nationwide. Mark Nichols, a member of the University of Nevada's Institute for the Study of Gambling and Commercial Gaming, says that those taking football bets are right to be worried about fan outrage. "Intuitively, it would make gamblers leery," he said. "Poor calls are difficult to predict, and gamblers don't like that."